What would you think if I told you that a 2019 Volkswagen Jetta set a new track record of 210.16 mph at the Bonneville Salt Flats? Well it did. Quite impressive, in my book. With this speed run the 2019 “Bonneville“Jetta broke the Southern California Timing Association’s (SCTA) Blown Gas Coupe (G/BGC) class record of 208.472 mph. Of course the Jetta was modified from its production-based EA888 engine and aerodynamically low 0.27 drag coefficient body shape. 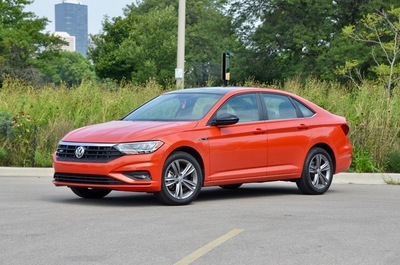 The 2.0-liter direct-injection and turbocharged engine in the Bonneville Jetta was modified for high output with new connecting rods, pistons, valves, camshafts, turbocharger, and exhaust system, but the basic block and crankshaft are stock. On the dyno, the engine achieved an output of 600 horsepower at 8500 rpm. Back in the world of everyday car usage, I recently had my second opportunity behind the wheel of the new Jetta. 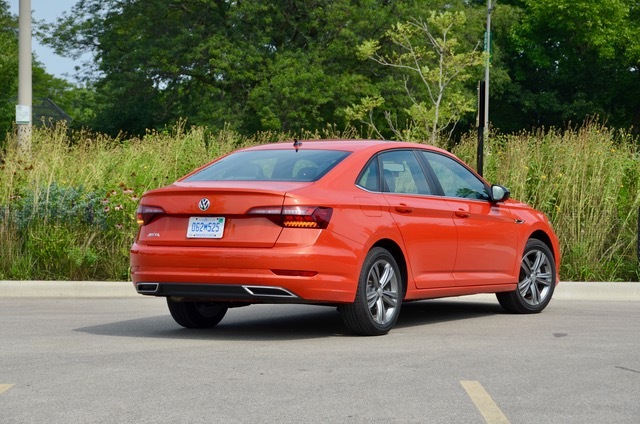 The Habanero Orange 2019 Jetta R-Line turned heads just like the Bonneville Jetta did. 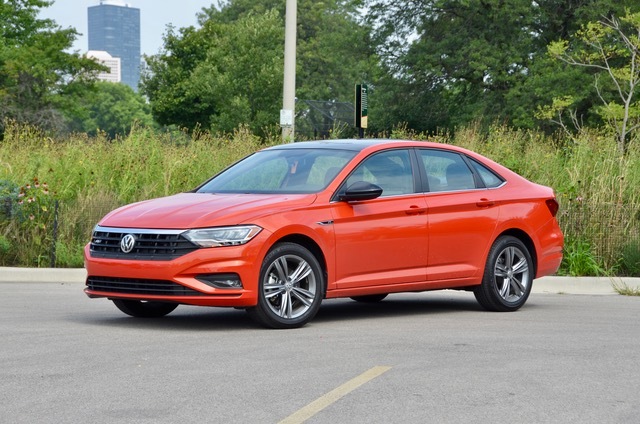 The sporty-styled R-Line trim has an MSRP of $22,995 and is one of five trims offered on the 2019 Jetta. It sits in the middle of the S and SE below it, and the SEL and SEL Premium above. Jetta prices start at $18,545 for the S trim. On the outside the R-Line has 17-inch alloys fitted with 225/45 tires. A black grille and mirror caps, fog lights, a more aggressive rear bumper with dual exhausts, unique leather-wrapped steering wheel, black interior roof liner and two-tone seats with contrast stitching all help make the R-Line stand out. VW fits the R-LIne with its XDS electronic differential, an electronic version of the traditional mechanical limited-slip differential. XDS helps improve stability and handling. Like all 2019 Jettas, the R-Line is powered by a 147-HP 1.4-L turbo that produces 187 lb-ft of torque. An 8-speed automatic drives the front wheels. EPA test-cycle fuel economy ratings for this powertrain are 34 mpg combined with 30 city mpg and 40 highway mpg. As it turned out my wife and I needed to drive from our Chicago home to Southeast Michigan for a weekend family event. On the 260 mile interstate drive heading east across lower Michigan the Jetta achieved a very efficient 43 mpg. Now I don’t hypermile. Time is money. I move quickly. My average speed was 74 mph while yet exceeding the EPA highway rating by almost 10-percent. The R-Line I drove was equipped with forward collision warning with autonomous braking, blind spot monitor, and a rear view camera (standard on all Jettas). Adaptive cruise control, lane keep assist and high beam light control is also offered in the Jetta line-up. My recommendation is to opt for all the driver safety tech you can get. It’s worth it. 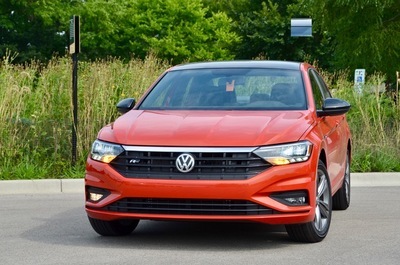 I had previously driven the all-new 2019 Jetta at VW’s media intro program. You can read my write-up from that event here. 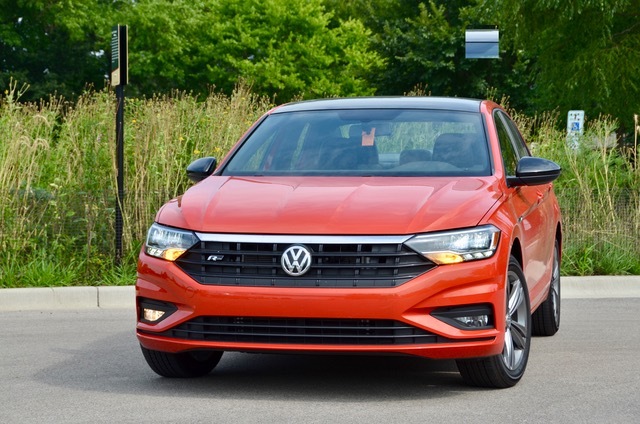 The new 2019 Jetta has been on sale since Spring this year. More information, specs and details on the entire model range can be found at www.vw.com. Volkswagen has put a lot of good value in the new Jetta. With more content and new features it’s actually priced lower than the previous generation Jetta. In today’s world of SUVs, crossovers and pickups being very popular, there are still a lot of folk interested in sedans. 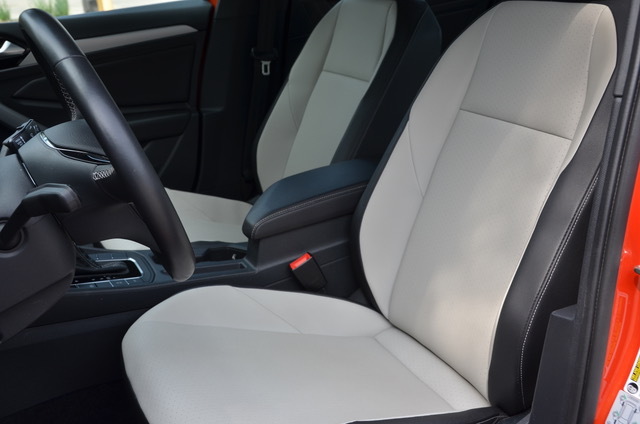 Actually, data shows that Gen Z buyers lean towards sedans. Why? They grew up with SUVs and don’t want to drive what their parents drove.